Of the five new Hermessence fragrances, I've already reviewed Myrrhe Églantine. Today, short reviews of the other two fragrances in Eau de Toilette, Cèdre Sambac and Agar Ebène. If you've smelled either of the two "perfume essences", Musc Pallida and Cardamusc, do comment, as I may or may not ever get around to them and it's a pretty good bet that I'll never buy them. I wanted a nice jasmine soliflore from Hermès for ages, not that I'd any reason to expect such a thing: it would not be their style. So instead, I got first the little spray of jasmine water that is Le Jardin de Monsieur Li, and which I do adore even if it is not hardly what I had in mind, and now, Cèdre Sambac, which again is not the perfume I was envisioning, and is not any sort of jasmine soliflore anyway. Cèdre Sambac is a bit of a departure for the Hermessence line. 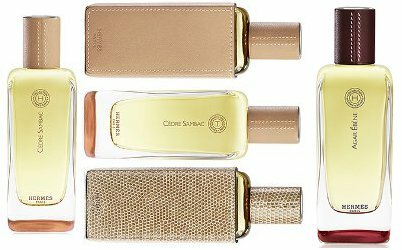 I don't think your average consumer would smell Myrrhe Églantine and immediately suspect a changing of the guard at Hermès; Cèdre Sambac is the announcement, perhaps, that perfumer Christine Nagel has her own plans for the range. It's dense and warm (early on at least), not so easy to wear, and it's frustratingly changeable on my skin. At least once I wore it and had lovely whiffs of jasmine all day (well, all morning anyway), but more often, the cedar predominates, or perhaps I should say that at times, the two elements seem so entirely intertwined (or so altered molecularly) that they become a new smell. It's slightly dirty / animalic, in a way that is hard to pin down: at times almost leather-y, at times almost cumin-y. The jasmine sometimes seems lush, sometimes airy, and while it doesn't immediately strike me as indolic in the traditional sense, at times I get a distinct undertone of mothballs. It's entirely unisex to my nose, although as is often the case with such fragrances, I'm guessing some men will find it too floral and some women will find it too woody. I thought the denseness might signal greater lasting power than some of the other Hermessences, but nope, not really. Myrrhe Églantine does a better job on that score. Verdict: Cèdre Sambac was not love at first sniff. It's arguably the most unusual of the bunch, though. I'm impressed, and I'll certainly spend more time with it. In case you thought Hermès would never do oud, here is their entry, although Nagel clarified for Madame Figaro that they were not jumping on the trend, and that Agar Ebène uses uninfected wood1 instead of the traditional oud (which as she notes, is rarely in perfumes that claim to feature it anyway).2 Whatevs, and for our purposes, it matters little. Agar Ebène is a polished, highly wearable, almost silky rendition of wood, dark-ish but not at all dense. It has a little trill of tartness in the opening, the teensiest little edge of pine-y smoke in the center, and a cloud-of-velvet finish. Verdict: Yum. If, like me, you are too cheap to buy the Musc Pallida and Cardamusc oils, you may be glad to hear that you can still play — Agar Ebène layers nicely with Myrrhe Églantine, although as the Myrrhe is the denser and longer-lasting scent, you'll have to be careful with the proportions. Meanwhile, Agar Ebène also smells perfectly elegant on its own. Overall: Fans of the Hermessences should be pleased by this new set. I am still hoping against hope that Jean-Claude Ellena will follow Pierre Bourdon and Alberto Morillas (among many others) and start his own fragrance line, but meantime, it's comforting to know I can still find things to buy at Hermès. I would guess that I'll drain my bottle of the charming crowd-pleaser, Myrrhe Églantine, first, but Agar Ebène will be a close second. I shall have to see if Cèdre Sambac grows on me, or if it remains the admired-but-misunderstood genius of the set. 1. I am not an expert, but from what I have read, uninfected Aquilaria wood has almost no odor and would not be called "agarwood" in any case; the term "agarwood" is usually used as synonymous with oud, that is, it is the resin from the Aquilaria tree after it has been infected with the Phialophora Parasitica fungus. But all of that is splitting hairs, since you never know what is in any perfume, and at this point everybody knows that most "oud" perfumes don't have any real "oud". 2. See Christine Nagel, nez d'Hermès : "Sans Orient, il n’y a pas de grands sillages". Thanks for your impressions Robin! I tried all 3 last week and I like Agar Ebene the most. Will be buying a travel set when I’m in Milan in two weeks and will be splitting the remaining little bottles among friends. Would love to know which sells the most — has to be AE or ME. It’s difficult to say, isn’t it? I can see Agar Ebene becoming really popular, especially among male audience. I say Agar Ébène is a leather scent, and a good one. Nagel builds an artful bridge here: She makes a statement by presenting the very first Hèrmes oud perfume, but then it’s not-really-oud to not offend JCE too much, and then she actually makes it leathery as a reminiscence to Hèrmes traditions. Agar Ebene is absolutely leathery scent. Kind of more wearable Cuir d’Ange. Sounds wonderful, thanks for sharing this. The Agar Ebène sure sounds tempting! I think a lot of people will like that one. I’m looking forward to trying these. It feels like it’s taking a long time for them to arrive in the U.S. I know! But for all I know, they’re in the Hermes boutiques already. As usual, I have not been to the mall in ages. I was told May by the San Diego boutique. Oh, you have lots of sniffing to do then! I miss Jean-Claude Ellena SO MUCH!!!! I was just on the US Hermes website and they don’t seem to offer the 15ml size, at least not at present. Hopefully that’s temporary. They are still there, just harder to find with the new redesign. Look under “fragrance sets”. Thanks. I had to search fragrance sets inside the site to find them. I am perplexed by the redesign — seems to make it harder to find anything you might be looking for. Chiming in late to say we took a little field trip to the Vancouver Hermes store to smell these, and also got to try the Cardamusc (but not the Musc Pallida) and it was delightful, smooth and close to the skin, but probably ridiculously expensive, so I won’t really think of it again, except as a nice experience. At £1,375 per 100 ml I would need way more than delightful! Although the price is worth a giggle or two.